Nothing says "southern" than seeding a field of cotton or being able to see the cotton plant up close to appreciate its beauty and harvest. 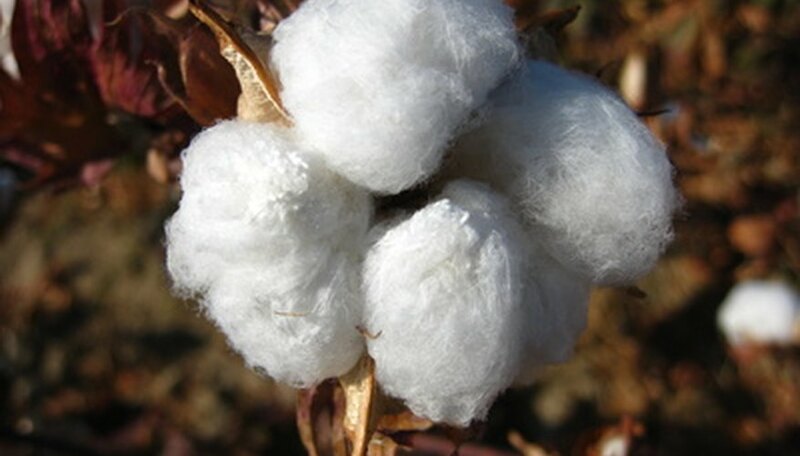 Needing a long, hot growing season of at least 160 days, cotton produces ornamental pink flowers that later become bolls that dry and split open to reveal the white cotton fibers. Provide a sunny location in a fertile, moist but well-draining soil with a crumbly texture that is enriched with lots of compost. Cultivate the soil to a depth of 5 inches with a garden hoe in the area where you wish to grow a cotton plant. Do this after the last expected frost date in the spring. Scatter some compost or well-rotted manure over the area to a depth of 1 to 2 inches. Incorporate the compost into the soil with the hoe and then smooth the grade. Allow the freshly tilled area to settle for at least 24 hours. Ideally, the soil temperature should consistently be no less than 60 degrees F (16 degrees C) according to Curl Brothers Textiles. Create a furrow or "hill" at a depth of 1 inch with the hoe. Place a cotton seed in the furrow every 6 to 12 inches (in a hill plant two to three seeds an equal distance apart). Replace the soil back atop the newly planted cotton seeds and tamp it down gently with your hand or the back of the hoe blade. Immediately water the seeds with a sprinkling can or irrigation system so that 1 inch of water soaks into the soil. The seeds should germinate in about five to seven days if the soil is warm enough. Water the cotton plants so that the soil remains moist but never soggy. Supplement natural rainfall with irrigation as needed to provide between 1 to 2 inches of water every week. In extremely hot or windy weather more watering may be needed to prevent the cotton plants from wilting. Monitor the growing plants and surroundings. Hand pick or hoe weeds and watch for any insect damage, such as chewed leaves. If insect damage is substantial, consider using an organic pesticide if natural bug predators do not control the pest insects. Reapply compost or well-rotted manure as a soil dressing around the cotton plants every three to four weeks during the growing season. Alternatively, mix a liquid, well-balanced fertilizer (10-10-10) into a sprinkling can and fertilize the cotton plants once a month or at a dosage and interval recommended on the product label. Cotton plants produce a lot more flowers and subsequent bolls if soil is moist and rich in nutrients. Continue watering and weeding as needed across the growing season. About 100 days after germination, the plants should flower. It takes an additional 50 to 60 days for the cotton bolls to ripen, according to Purdue University. Harvest cotton carefully once the bolls crack open fully and the fibers dry. Use care when picking cotton as the seams from the boll harden and become thorn-like prickles. Bolls ripen at different times across a four-to-eight-week period in autumn. Allow the cotton plant to naturally die after you harvest the cotton. Consider plucking seeds from the boll to use next year. There are about 30 seeds in each boll among the white or tan fibers. Even if cotton bolls do not fully ripen for harvest, cotton makes a pretty ornamental flowering annual for a garden. Use gloves when plucking the cotton so you avoid the four sharp capsule thorns. It's not unusual for bare fingers to leave bloodied after harvesting cotton. What Type of Plant Is Cotton?